The Regal is Buick's third vehicle designed to attract younger buyers. Twelve vehicles will make world debuts this week at the Los Angeles auto show. Many are slightly altered versions of vehicles in production outside North America and of previously seen concepts. The surprises will be the redesigned 2011 Toyota Sienna minivan and concepts from Honda and Volkswagen. The three automakers have revealed little about their vehicles. Probably the most talked about vehicle at the show will be the production version of the Chevrolet Volt plug-in hybrid. Sales begin late next year. Vehicle unveilings are scheduled for Wednesday and Thursday, Dec. 2 and 3. Check autonews.com on those days to see the world debuts. The 2011 Regal, which goes on sale in the second quarter of 2010, is Buick's third product aimed at rejuvenating the brand and attracting younger buyers, after the Enclave crossover and LaCrosse sedan. The Regal essentially is a rebadged Opel/Vauxhall Insignia sedan. The car will be assembled in Germany until about mid-2011, when production will be transferred to North America. 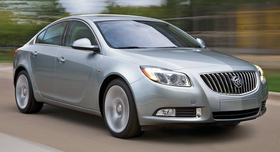 The Regal, Insignia and Buick LaCrosse share GM's global mid-sized, front-drive platform. But the Regal is 6.8 inches (about 173mm) shorter than the LaCrosse, and the wheelbase is trimmed 3.9 inches. The Regal will be available with a four-cylinder engine and positioned below the LaCrosse. Buick will highlight the Regal's European-tuned chassis, an optional turbocharged engine and a suspension that allows drivers to change tunings. Chevrolet will have two high-profile models in Los Angeles: the production version of the Volt, left, and the Cruze subcompact. Chevrolet will reveal the long-awaited production version of the electric-driven Volt and the U.S. version of the Cruze small car. The Volt can travel up to 40 miles (about 64km) on electricity alone. When the Volt's lithium-ion battery is depleted, the gasoline engine powers a generator, extending the driving range to more than 300 miles before refueling or recharging. Volt sales begin in late November or early December 2010. Pricing has not been announced, but sources say the 2011 Volt will sticker at about $40,000 before a $7,500 federal consumer tax credit is applied. The Volt and 2011 Cruze share GM's global fwd compact-vehicle platform. The Cruze, now on sale in Asia and Europe, eventually will replace the Cobalt. The Cruze will be equipped with 10 standard airbags and offer such features as a navigation system, Bluetooth connectivity and XM Satellite Radio. Sales begin in the third quarter of 2010. A turbocharged, 1.4-liter four-cylinder is one of the engines that will be offered. Cadillac's CTS coupe -- delayed a year by GM's financial woes -- goes on sale in summer. The 2011 Fiesta is an fwd subcompact that is larger than the Ka minicar, which Ford sells in Europe, but smaller than the Focus. U.S. sales begin next summer; the Fiesta will be assembled in Cuautitlan, Mexico. The Fiesta is the first vehicle in CEO Alan Mulally's plan to build many of Ford's cars and crossovers around the world on global platforms. The Fiesta platform was engineered by Mazda. The Fiesta went on sale last year in Europe. A four-door sedan and five-door hatchback are planned for the United States. The U.S. models have a distinctive grille and fascia. A 1.6-liter four-cylinder engine will power the car. Ford also will unveil the 2011 Mustang. The news is under the hood: a new 3.7-liter, 24-valve V-6 that cranks out 305 hp. Ford says the 2011 Mustang will get an estimated 30 mpg on the highway. Honda says the P-NUT will "demonstrate a futuristic concept for an ultracompact, aggressively designed coupe." The concept debuting in Los Angeles was created by stylists at Honda R&D Americas in Pasadena, Calif. P-NUT stands for Personal Neo Urban Transport. Infiniti will unveil the redesigned 2011 M sedan. The car will offer a 400-hp, 5.6-liter V-8 in place of the previous 325-hp, 4.5-liter V-8. A larger V-6 engine also is planned. Sales begin in April. A two-mode hybrid will debut about a year later. New technology includes a blind-spot intervention system that alerts the driver to an unseen vehicle during a lane change. The system nudges the M's steering to keep the car in its original lane. Mazda will unveil the 2011 Mazda2, a small five-door hatchback that shares a platform with the Ford Fiesta. Mazda2 sales begin in fall 2010. The Mazda2 is sold in Europe and Japan. The car debuting in Los Angeles features such midcycle changes as the "happy face" front-end styling depicted on other Mazda models and a five-speed automatic transmission. The Mazda2 has been named car of the year in more than 20 countries and has been a sales success. Porsche's 2011 Boxster Spyder convertible goes on sale in February. Porsche is introducing the redesigned 2011 Boxster Spyder, a soft-top model that the automaker says will be its lightest at 2,811 pounds (907kg). The car is powered by Porsche's 320-hp, 3.4-liter six-cylinder engine. Sales begin in February. Toyota is taking a stab at changing its minivan image with the third-generation Sienna. The 2011 Sienna has an edgier profile, moving away from boxy. Nineteen-inch wheels will be available for the first time. The interior is larger and more comfortable and comes in seven- and eight-seat configurations. Volkswagen is mum on details, but the automaker says a four-seat concept will debut.